Will they find the treasure or be captured by pirates? When King Manuel of Oro announces his ten-year-old son’s crowning ceremony, Leo’s world crumbles. He doesn’t want to be a stuffy old prince! He wants to be free to have adventures, roam the kingdom, and spar with the crew of the royal navy. Dreading the upcoming ceremony, Leo longs to have one final adventure before taking on his royal duties. His wish comes true when he accidentally stows away and the ship is taken over by pirates! He is furious when he discovers that his sister, Nina has followed him and is also trapped on board. But when Duke, a young pirate Leo’s age, warns them to flee the ship before they’re caught, they persuade Duke to join them. 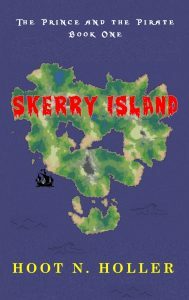 The kids escape to a nearby island, discover a treasure map, and set out to find their riches. They brave the dangers of the jungle and angry pirates on this wild adventure seeking the island’s hidden treasure!